It has become pretty cold recently, so let’s recall some memories from summer, or at least warmer places. This time I would like to share with you some memories from my short trip to Kumamoto in the beginning of November. Actually, as I went there to attend a conference I did not have enough time for sightseeing. But at least I visited the main spots of Kumamoto city. First of all, I went to Kumamoto Castle, which surprised me with its huge wall, beautiful garden and interesting exhibitions inside. Next I visited the Japanese garden, called “Suizenji”. I was very lucky, because the garden was about 5 minutes walk from my hotel. The garden is a beautiful green oasis in the centre of Kumamoto city, and I would recommend it to everybody to visit it. Everybody recommended me to try Kyushu ramen, but as I am not a big fan of this meal, my gourmet experience was limited to “ikinari dango”, which I fell in love with and “karashi renkon”, which I won’t miss much. I liked Kumamoto very much, not just because of the sightseeing spots, and lovely “ikanari dango”, but mostly because of the friendly people, who spoke to me on my every step. Well, there’s now been 3 weeks since I had started working here (already 3 weeks, time flies!). Through this time, I discovered that many of you are very interested in my country, but very few of my new friends know (well) about Kazakhstan. That’s why, this time I would like to provide with some basic information which would probably be helpful to you. So, where is Kazakhstan situated? If you look at the map of Eurasia, you will find it in the heart of the continent. Being sandwiched between Europe and Asia, Kazakhstan lies at the crossroads of world civilizations (chinese, turkic, etc.) & religions (Islam, Christianity, Buddism, etc. ), and has a vast land offering varied landscapes of taiga, steppes, deserts, mountains, hills etc. It borders with Russia, China, Kyrgyzstan, Uzbekistan, Turkmenistan and Caspean Sea. Kazakhstan,with a territory of 2.7 million sq.km., is the ninth-largest country in the world (or about six times the size of France), but has only 16 million people (or less than one-quarter of France’s population). However, there are more than 100 nations/ethnics living peacefully in the country, e.g. kazakhs, russians, ukranians, germans, dungans, uzbeks, karakalpaks, koreans, etc. And all of these ethnic groups have their own languages, customs, religions and so on. But, basically, they communicate in Russian. According to the latest data (just checked it out) , 62% of kazakhstanis (elder than 15 years old) write and speak fluently in Kazakh, 84.8% - in Russian, and 7.7% - in English ( :O very low! I expected more…). What else? Mmm… oh, yea, the main industry. It is often asked too. As I told you (some of you), Kazakhstan has enormous rich natural resources, and at present time, oil and gas industry (export of crude oil) is the main source of our revenues. And agriculture: because of its high quality (high protein), Kazakhstan’s wheat attracts overseas consumers, hence its export market is expanding now. Interesting fact: Astana, a capital of Kazakhstan, means ‘capital’ in Kazakh. So, it sounds like: Capital is a capital of Kazakhstan (kaz. : Қазақстанның астанасы – Астана). Well, I wrote a veeeerrry little, which is definitely not enough for my inquisitive friends. So just keep asking me, and I will try to give you a more or less good answer. Come to our café to satisfy your curiosity! PS: Good news! International Party at CCC this coming Sunday (Nov. 21st ). Looking forward to seeing you there!!! The school I go to is right next to Maruyama. During the middle of summer I went up there at night with some acquaintances and we saw lots of shooting stars. Actually, they all saw around, while I only saw 2. Nevertheless it was a beautifully clear night to see stars shooting out through the sky over Sapporo. At that time the vegetation was lush and green, and the weather was nice and warm. wearing a down jacket or any similar attire with good heat retention. I was comfortable wearing just pants, boots, a sweater and a t-shirt. 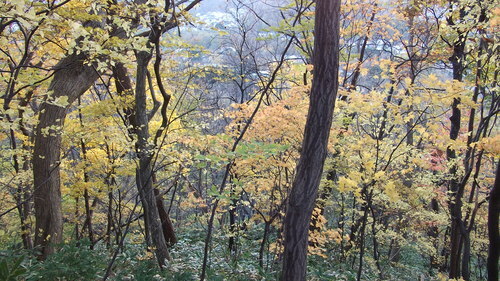 surrounding Maruyama through the cover of yellow and orange tree leaves in the foreground. This time I would like to continue the Halloween’s topic, which I have started two weeks ago. As I have already written we don’t celebrate Halloween, partly because we have similar event just two days after the Halloween, which means on 2 November. 2 November we call All Souls’ Day, it is Christian tradition of praying for those who passed away. It follows the All Saints’ Day, which we celebrate on 1 November. The tradition of All Souls’ Day goes back to 10th century and still now it has strong influence among Czech people. Rather to Halloween it is similar to Japanese “Obon”. During 1 and 2 November we gather with our family and relatives at our hometowns, visit together church and grave, which we decorate with candles and flowers. On the contrary to Halloween, All Souls’ Day is very quiet and calm event, it is the time of recalling our memories about those who passed away. But I would not say, that it is a sad event, for example, the flowers and lighten candles symbolizes the eternal life, and as long as the graves are all lighten up and decorated it means that the memories are still alive. In this way, this event is also an important event for every family and its roots. Didn’t say much about it at the time, but about a month ago I went to Niseko, to suss out jobs for the ski season. From what I’d heard, the majority of the hotels and businesses in the area are Australian owned, and the place gets a lot of foreign custom, mainly Australians, Chinese and Singaporean, so my beginner’s Japanese was not likely to be a problem. The hitchhiking out took about two hours and I got dropped right in the middle of Hirafu. The first guy that picked me up was one of the few travelling with children that has stopped for me. Not only that, but, because the front seat was covered in various bits and bobs, he told me to get into the back beside his six year old son. Not only THAT, but after about ten minutes he pulled into a convenience store parking area, turned to me, said “Wait a minute”, and disappeared into the shop, leaving the keys in the ignition, and me and the kid sitting there looking at each other. He came back with drinks for all and we resumed the journey. A really nice guy, but you wouldn’t find that happening in Ireland! Once in Niseko I began hitting the businesses, starting at the very top of the hill in the hotels etc. nearest the main ski lifts and working my way down. The ones at the top didn’t need anyone, or if they did they were looking for someone who spoke Japanese. This was true for most places until about halfway down when I got invited into an inn (Japanese owned) and offered a job on the spot, cleaning rooms etc. I decided to keep asking around to keep my options open, as the pay wasn’t great in this particular place and free time to enjoy the snow would also be limited. I would also have to buy a ski pass out of my own pocket which I really was hoping to avoid. The employers I met during my job search were very helpful and even if they didn’t have any job openings for me they were more than willing to give me pointers on places that might be hiring. The ones who were looking for people often invited me in for an interview, as most of the applicants they get apply online from abroad and so they don’t get to meet them in the flesh until after they’ve been hired and show up for work. Employer: So, do you have any bar experience? Damien:Well, I did a bar and restaurant course about three or four years ago, but I’m not going to pretend that I remember any of it now. Damien:I also work part time in my landlady’s bar at the moment, but my job is more focused on talking with customers than serving drinks, so I don’t know if I’d even class that as experience either. Employer:Well, some experience is still better than nothing, you know. Perhaps not what one might call “selling yourself”. You can imagine my surprise when I got an email from that employer a month later offering me a position running the bar in his hotel. I’d hate to see what the online applications were like. I had to decline this offer, though, as I’d already accepted a position in another company with three outlets – a bar, restaurant and café. They have a few ski passes which are shared among staff, a reasonable salary and plenty of hours if I want them, which I will. They also arrange shared accommodation, which is a little bit expensive – twice what I’m paying at the moment – but then again it’s a pricey area. All in all, a day well spent, although I did think I was going to get stranded out there as the shadows were growing longer while I stood at the side of the road trying to thumb my way back home. Thankfully, just as I was about to give up and try the train (oh the horror), two girls on their way home to Kita Hiroshima via Sapporo picked me up and dropped me off in town.